KITENDE – Villa started strongly and got the first chance of the game but Emma Kalyowa shot over after he was teed up by Mutombora’s weak clearance. Moments later, Pius Wangi made a powerful run down the left, played in Bashir Mutanda who shot straight at Mutombora. At the other end, Tito raced through on goal after a well weighted pass by Moses Waiswa but the striker could only see his effort foiled by Keni. On 8 minutes, Villa were not to ne denied for a third time as they took the lead through Charles Lwanga who was played in on goal by Wangi. Vipers could have levelled matters instantly but Dan Sserunkuma headed over after Villa failed to clear their lines following a routine Waiswa corner. SC Villa who had not won any of their last 5 game increased their lead. Wangi fed off a loose ball in the area after Vipers failed to deal with a John Adriko corner and directed it into the top left corner. With 27 minutes played, Karim Niyizigimama sent a teasing cross into the Villa area but Tito headed it straight onto the upright. Innocent Wafula pounced onto the rebound but flashes his follow-up over a helpless Said Keni in Villa’s goal. Tito was at the heart of all Vipers’ attacks and at the half hour mark, fired a ferocious strike which was parried away by Keni and Ndahiro Derrick clears the danger. The first yellow card of the game was shown to Villa’s John Adriko for a foul on Sserunkuma as Vipers broke on a counter. With the first half approaching its climax, Vipers got a free-kick on the right. 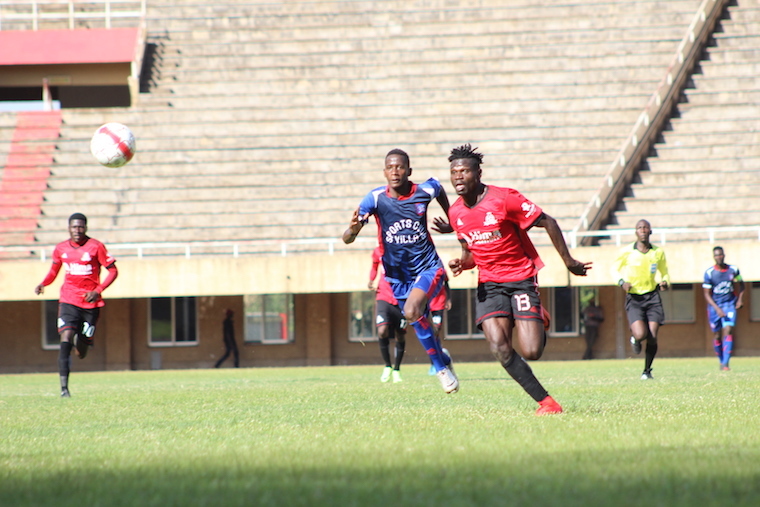 Debutant Niyigizimana sent it in and it was cautioned into the path of Tito by Ssenfuka and the striker blasted it into the roof of the net for Vipers’ first goal and in the process half the deficit. By halftime, Vipers were looking the better side and pressing for the equalizer. At the start of the second half, Villa head coach Douglas Bamweyana introduced Joseph Ssemuju in place of the injured Pius Wangi. Ssemuju was in the thick of things instantly, first getting booked on 48 minutes and then getting onto the score-sheet. The former Express Fc winger rose highest to node Kalyowa’s free-kick from the right passed a helpless Mutombora. At the other end, Wafula hit the up-right after poor defending by Ndahiro but the ball was collected by Keni. Viper looked to have upped their game and four minutes later, Lutimba sent a long ball over the Villa back line but Sserunkuma’s loobed effort went argonizingly wide. In search for goals, Vipers sent on Hamis Diego Kizza in place of goalscorer Okello on 55 minutes. In response, Villa took off Lwanga and replaced him with Albert Mugisa to try and control the game better. Vipers made two more substitutions, sending on the duo of Abraham Ndugwa and Duncan Sseninde in place of Rahmat Ssenfuka and the injured Lutimba, in quick succession. On 67 minutes, Keni pulled off a stunning save to foil Waiswa who had curled a shot from just out-side the area. Moments later, Wafula sent in a cross from the right which fell on top of the net. In the process, Keni injured himself as he tried to make sure the ball had flown over. With 13 minutes to play, Vipers Captain Tadeo Lwanga was booked for a nasty foul on Ashraf Mandela. The final chance of the game fell to Vipers’ Sserunkuma who nodded weakly into the ground and Keni collected comfortably. Vipers have become the second top side that Villa have defeated this season after the Jogoos also overcame Express 2-0 in December. The win on Saturday means that Villa climb into 12th on the log with 18 points from as many games. For Vipers, they remain second, four points behind leaders KCCA FC.